Santa Paws. Photo by Toni Lund. Santa Paws: An event for the whole family, with or without pets. Have fun and help homeless dogs and cats at the same time! Bring the family, your dog, cat, hamster, goats or whoever is your favorite friend for a photo with Santa by photographer Mike Jones! 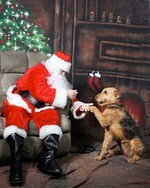 This year Santa is looking forward to granting wishes to dogs and cats everywhere who need a forever home. You can help him by stopping by with your loved ones to have a beautiful keepsake photo taken. Your $15 donation will help the lost and abandoned dogs and cats of The Canine Sanctuary, a 501c3 not-for-profit organization run entirely by volunteers.. Start your Christmas shopping early by having this beautiful 5x7 photo ready for gift giving. Refreshments for humans and our favorite four legged friends.